Tanga was founded on January 1, 2007 and is located in Chandler, Arizona US. The owners of Tanga also operate LOLShirts and BelleChic. 6 new deals are added on Tanga every day. The deals range from electronics, games, t-shirts, magazines, jewelry and more. The site also offers a unique rewards system that allows you to earn discount coupons when you place orders on their site. 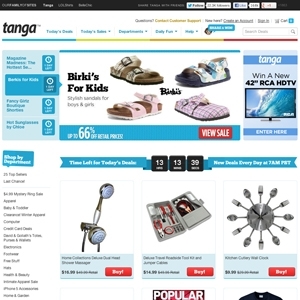 Tanga.com currently ranks #30 amongst sites offering online deals -- Meijer ranks #29. In the General Merchandise category, Tanga ranks at #20 -- Meijer.com again ranks slightly higher at #19.